The uncommon sensory perceptions of synesthesia explored through accounts of synesthetes' experiences, the latest scientific research, and suggestions of synesthesia in visual art, music, and literature.What does it mean to hear music in colors, to taste voices, to see each letter of the alphabet as a different color? These uncommon sensory experiences are examples of synesthesia, when two or more senses cooperate in perception. Once dismissed as imagination or delusion, metaphor or drug-induced hallucination, the experience of synesthesia has now been documented by scans of synesthetes' brains that show "crosstalk" between areas of the brain that do not normally communicate. 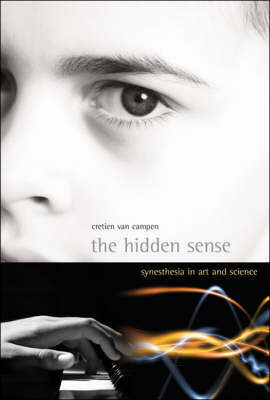 In "The Hidden Sense", Cretien van Campen explores synesthesia from both artistic and scientific perspectives, looking at accounts of individual experiences, examples of synesthesia in visual art, music, and literature, and recent neurological research.Van Campen reports that some studies define synesthesia as a brain impairment, a short circuit between two different areas. But synesthetes cannot imagine perceiving in any other way; many claim that synesthesia helps them in daily life. Van Campen investigates just what the function of synesthesia might be and what it might tell us about our own sensory perceptions. He examines the experiences of individual synesthetes - from Patrick, who sees music as images and finds the most beautiful ones spring from the music of Prince, to the schoolgirl Sylvia, who is surprised to learn that not everyone sees the alphabet in colors as she does. And he finds suggestions of synesthesia in the work of Scriabin, Van Gogh, Kandinsky, Nabokov, Poe, and Baudelaire.What is synesthesia? It is not, van Campen concludes, an audiovisual performance, a literary technique, an artistic trend, or a metaphor. It is, perhaps, our hidden sense - a way to think visually; a key to our own sensitivity. Cretien van Campen is a social scientist at the Social and Cultural Planning Office of the Netherlands. He is the author of two books on perception and visual art.